Unlike most my teenage friends at the time, I didn’t ever desire a tattoo in my youth. With a budding desire to fulfil my ambitions– I made an instinctive decision to get a tattoo! The idea had flown around over dinner with my husband whilst in Thailand, on our return it was no longer an if, but a when. I researched a few design studios and artists, but Tim Gouldthorpe stood out a mile, because with a background in art, and driven desire to create innovative ink, I knew he was my man. The whole experience was spot on. The pain wasn't anywhere near as uncomfortable as I had imagined and I didn’t have any trouble with the healing process. Looking down at my leg for the first time was pretty breath-taking. I felt a certain juxtapose – I now had Pang on my leg, and there was no forgetting her, because she was etched there forever. 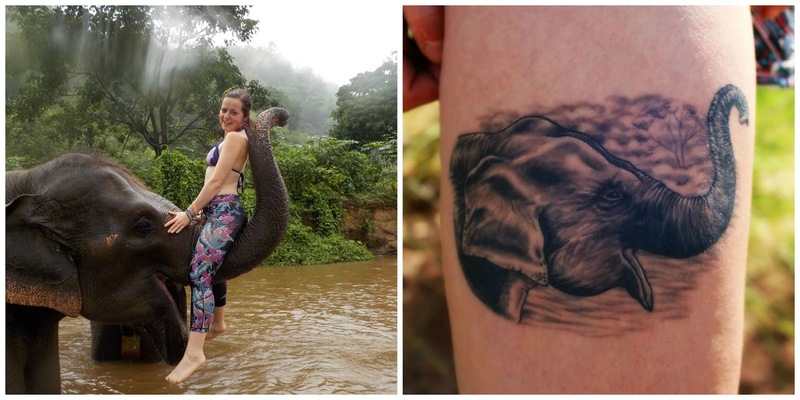 A lot of people are a little shocked at the size of my elephant, but it was so important for me to have the ink visible on my leg – mostly because when I run she is noticeable and a little nod to Thailand in the distance. It’s definitely a talking point, and something I can keep secret most days underneath my jeans or trousers, but when in summertime, or ultimately travelling she may just appear unannounced. A massive appreciation to Tim – who brought Pang to life. Black Rose Tattoo Parlour, Tickhill, Doncaster, South Yorkshire. Now this is a perfect example of why people should get a tattoo - not for fashion or for fun, but for a real, personal, and meaningful reason. Aww thanks Gem. So much. I love elephants a lot, but of course this one especially.